Make this lovely teabag-flower, in no time at all. The art of making a teabag-flower looks harder than it is. 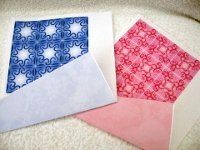 There are a lot of papers around, suitable for this technique, but don't use one that is too thick or you will have difficulty folding it. 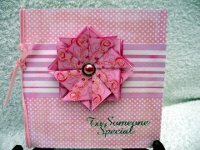 The one I have used is from a CD from Crafters Companion. There are several different patterns to choose from and lots of different colours. Just choose your colour and print it off. This is the paper as it is printed off, with nine matching squares on the sheet. I decided to use the pink one. The finished card it is at the end of the page. 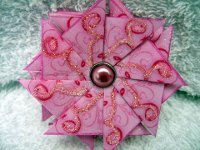 The video will help you to see how the paper is folded to achieve the flower. We are ready to make the card. And these are some of the things you will need. I have two sheets of blending paper, an assortment of brads to choose from. Some ribbon to go around the spine and of course the card blank. Glue the paper to the card. 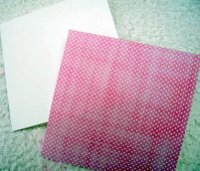 I chose a pink spotty paper for the base, and the stripey one as a panel. I ran the glue pen around the swirls, and then sprinkled it with Glamour dust. The centre is a pink pearl brad. It's now ready to be mounted on the card. The sentiment is a peel off, and a narrow velvet ribbon is around the spine. Very pretty card for a young lady to receive. Return from Teabag-flower to Homepage.